Central Park Features A Clever 19th Century Geolocation System Based On? In The Early 2000s, Apple Had Issues With An iBook Laptop That Smelled Like? Though only 2.5 miles long by 0.5 miles wide, the green and forested 843 acre expanse of Central Park in New York City is easy to get lost in–especially if you’re a New Yorker used to navigating the systematically laid out grid of the surrounding city. 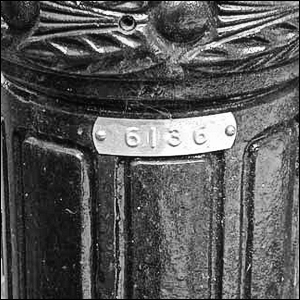 Thankfully, there is a handy system of codes stamped on each of the park’s 1,600 cast iron lamp posts that make it very simple to link your hike through Central Park to those very organized city streets you’re longing for when you’re lost. Each lamp post has a four digit code. The first two digits correspond to the closest cross street (like 97th Street) and depending on whether the last two digits are even or odd, tells you if you are closer to the east or west side of the park.